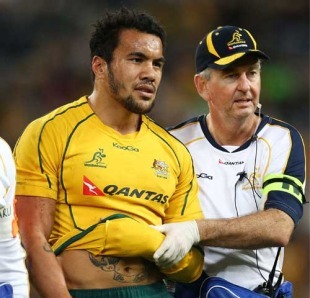 Australia have received a timely boost as they prepare for the Tri-Nations with the news that wing Digby Ioane does not require surgery on his dislocated shoulder. The Reds flyer picked up the injury in last weekend's loss to England in Sydney and had been set to go under the knife before missing the Tri-Nations to complete his rehab. Further scans have however revealed that he could return to action in four weeks, rather than the four months originally slated, after undertaking an intensive program. He missed a large part of 2009 to undergo a shoulder reconstruction. Should his recovery go to plan he could be a surprise option for the Wallabies' Tri-Nations showdown against the All Blacks in Melbourne on July 31. "It's like coming back from the dead," Ioane told AAP. "I was supposed to be out for four months. God's been good. I've been praying for the last four days. I'm just really pumped. "My major goal is to be back for the Test in Melbourne but I don't want to rush things, just take my time and make sure I'm 100%. I'm just happy I don't have to have surgery anymore." Meanwhile, his Wallabies team-mates take on Ireland in Brisbane on Saturday.